A generous gift from a family friend enabled my family and I to dine at Cafe Mezzanotte last weekend. Located in a small professional complex on the southbound side of Ritchie Highway in Severna Park — with neighboring offices belonging to doctors and surgeons — apart from any other restaurants or bars, Cafe Mezzanotte has been in the same location since the early 1990′s. In a few words, it’s a classy and rich experience. This is a restaurant that takes and more importantly honors reservations. There are lots of places that will gladly take your name and then not have a table ready when you arrive. Rest assured that if you choose to make a reservation, your table will be waiting when you arrive at the agreed upon time. Lights dim, we were seated immediately in part of a two-tiered dining room by an impeccably dressed and groomed host. The room is tastefully decorated and noticeably warm, taking the chill off of the 30 degree night. The linens are fresh, changed after each meal. Warm and soft bread is provided shortly, with a good blend of seasonings mixed into olive oil. While were we deciding on our entrees, we split an antipasto plate ($12.99) featuring cured meats, cheeses and roasted vegetables. No need to add additional seasonings to the plate. Once our meals were delivered (also with a sprinkling of fresh parsley), a gentleman arrived at our table offering freshly cracked black pepper and Parmesan cheese. Yes, please. That kind of specific service reminded me of the dedicated crumb scraping tool at Maria’s Sicilian Restaurante. 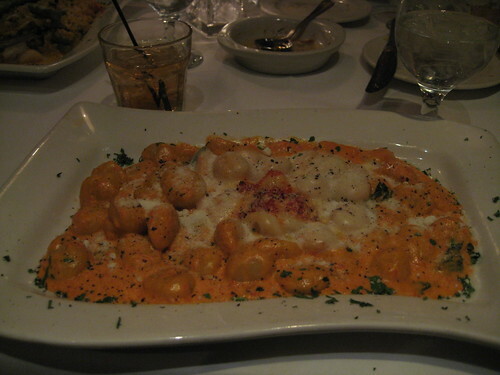 Pictured above sans flash (so as not to disturb other diners), the gnocchi was extremely good. The pasta was tender but held its shape and the flavor of the pasta itself wasn’t overrun by the filling or sauce. The potato and ricotta cheese melted away in my mouth. That’s a phrase that I feel I’ve used repeatedly when describing excellent food, yet haven’t come up with a better way to describe it. The rosé sauce was rich and filling; I doubt they’d share their recipe but I’d love to have it. Hopefully some of the online recipe sites can assist in the meantime, because it’d be a delicious way to spruce up regular pasta dinners. The service was excellent. Our server rattled off the daily specials with a slightly robotic air, but it wasn’t indicative of the service following. Water was refilled often, but I never felt like the server was hovering over our shoulders. For me, the lack of hovering intrusion is a key distinction between good and excellent service. Very well done here. One extra nice point about service: leftovers are boxed up and kept in the back until you finish your desert at which point they’re brought back out, so they don’t take up space on the table. I don’t know how Cafe Mezzanotte compares to Pasta Plus, since I haven’t been there yet. The prices are a touch higher at Cafe Mezzanotte, though that may just be the difference between eating out in Severna Park rather than Laurel. Four entrees, one appetizer, four deserts (which are so excessively sweet and delicious that I won’t even attempt to do them justice), and a single glass of Woodford Reserve (very reasonably priced) ran just shy of $150 before tip. Cafe Mezzanotte allows you to sit down with friends, family, or a loved one in a quiet and intimate environment and enjoy a wonderful meal, expertly prepared and served. When restaurant rows seem to be filled with people-moving chains more concerned with seating more and more guests, I think the small premium for this sort of atmosphere is well worth it. I’m not sure I’d say PastaPlus has ambiance- but it is *definitely* worth a trip for takeout, at the least. My college roommate who lives down the street from you is a huge fan, and took us to pick up food there- almost everything is fresh handmade noodles, and pure deliciousness. I had one of the ravioli dishes and was very impressed. If you ever make it out Rockville way, another superb Italian place is Il Pizzico. It looks like a hole in the wall, but the food is consistently great and they have a very solid wine list. Never heard of Mezzanotte so I will have to give it a try. Pasta Plus is very nice, but I’m not sure it’s worth the ridiculous waits. I go early in the evening when it’s not a zoo. Pasta Plus is not as polished inside as Mezzanotte but the food is well worth it. When I worked in Beltsville, we used to make trips up to Pasta Plus on a weekly basis. I haven’t been there in years and I miss it. Might have to take a trip over to Laurel sometime soon and get a fix. Mikaiya: I’m really kicking myself for not getting over there yet. Every review I read — including the comments here — suggest that it’s a jewel. I’ve added Il Pizzico to my wish list on Urbanspoon; perhaps an adventure on the Metro is in my future. yellojkt: I hear the weekend dinner lines are legendary. While that’s somewhat comforting to know, I’d definitely opt for a weekday evening or an early dinner. Damien: Weekly trips? Even though Beltsville is close, that’s pretty impressive considering all the nearby restaurants. Indeed, we went there about once a week. Maybe we were in a rut, but it was a good rut. The address of the business was Beltsville, but it was really north of Beltsville off route 1 near the big Ritz camera shop. We pretty much went to Laurel most of the time for lunch cause the options were better then south on route 1 – except for Hogs on the Hill near Powder Mill road.